The Xorai is unequivocally the most common symbolic artifact anyone may find in an Assamese household. With the onslaught of capitalist take-over and consumerism, the baan-bati, paan-bota, and the kahor-kanhi, which earlier were essential commodities in an Assamese dining table, has ceded way to glass crockery and the ones made of china clay and melamine. Some other products are more commonly found in villages and is still in much use, such as the koloh, tal, etc. However, the cultural significance of these brass and bell metal items, endowed with utilitarian and aesthetic value, remains largely undefeated. In the most auspicious of occasions— starting from initiation ceremonies to marriages, and solemn ones like funeral ceremonies— these artifacts have a venerated usage altogether. Nonetheless, we cannot discount the fact that the brass and bell metal industry of Assam is reeling under the pressures of a failing economic model, causing concerns of livelihood and employment generation. 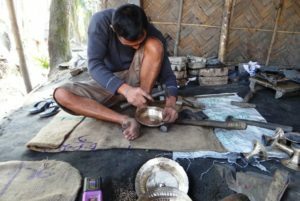 Today the brass and bell metal industry of Assam is concentrated primarily in two main clusters— Sarthebari in Barpeta district and Hajo in Kamrup district. Sarthebari holds the pride of place because of its rich history, accentuated by folklore and local legends for a long time. The Ahom kings were the great patrons of the bell metal smithy. Legend has it that a renowned kanhar named Jieudhan from Sarthebari made a pair of bhortaal and encrusted them in a wooden tiger with such dexterity that the moment the tiger was touched, it roared with ferocity as that of a real tiger. Swargadeo Siva Singha (1714- 1744 A.D.), his royal patron, was so pleased with his meticulous craftsmanship that he conferred upon him the title Choudhury while also donating 100 puras of land. The kanhars were entrusted upon making artifacts that would don the Ahom palace. It is interesting to note that the use of bell metal items during those days was out of bounds for people not belonging to the gentry. Following the Ahoms, the Koch kings endorsed this industry. With the coming of the colonial rulers who sprinkled the seeds of an economic restructuration, the brass and bell metal industry had to bear the brunt of increasing competition from the Marwari and Bengali tradesmen. As a consequence, the business shrunk in size in all other regions except Sarthebari. Fast forward to 2017, and Sarthebari still is as sleepy and caught in time as it was during the heydays of Colonial rule. Nothing much has changed in this small town. With minimal government support and virtually zero incentives, the industry is on the verge of a closedown. With machine made items burgeoning in the market, Sarthebari’s kanhars have found themselves locked in dire straits. They are facing difficulty in catering to the demands of the people, the production process yet being traditional. To add to these disadvantages, there is a severe scarcity of raw materials as the channels through which scrap metals are brought into Sarthebari is tightly controlled by the third party mahajans. The cost of the raw materials is priced high, and the procurement of the same is a time consuming process. Bell metal being an alloy of copper and tin, the mixing of the metals needs extreme precision. The mixing proportion is to be maintained at a ratio of 78:22, that is— 78% copper and 22% tin. It was the master artisan Bhaba Nath Bhuyan who pioneered the art of making raw materials by mixing the two virgin metals in conformity to the 78:22 ratio. Similarly brass, which is an alloy of copper and zinc, has to be mixed in the ratio of 70:30, followed by a nearly similar process of production as bell metal. The virgin metals viz. copper, tin, and zinc are not readily available in the region, making it all the more difficult for the artisans not to rely on the mahajans. The Bell Metal industry is not yet under the total grasp of the mahajans, as the Assam Cooperative Bell Metal Utensils Manufacturing Society which was set up in 1933 often comes to the rescue of the poor artisans by helping them source the raw materials needed for production. The same cannot be said of the brass industry because of the absence of strong cooperative societies and unions. Also, since it is more of an informal business that operates from every household at Sarthebari, the younger generation is unwilling to take up this profession for want of social mobility. The reluctance is being strongly felt in some of the newer products that are in the market where the lack of the earlier scrupulous attention given to the making of these items is clearly visible. Entrepreneurial spirit among the relatively well off is also terribly lacking. A large part of the Assamese identity is encapsulated in the brass and bell metal products. The prestige accorded to it, till recently, was only behind gold and silver ornaments. From Naamghars to Satras, from Dewalays to Mandirs, these products can be seen in almost every social space. Traditional musical instruments, such as those used in the bhaonas, and borgeet performances were made of brass and bell metal. With the social and cultural landscape of Assam changing, the importance of these items is seeing a sharp decline. Hence, the smithy has turned to producing more upmarket items such as flower vase, clock frame, modern metal crockery etc. Sarthebari has found itself suspended in a schism, with few opportunities beyond those of its traditional heritage. Strong initiatives need to be taken to enhance tourist flows to this sleepy old town, and this demands the proactive role of the government. How far Sarthebari becomes successful in challenging the odds, only time will tell.